Diving into an 850-page biography of one of the most monstrous and powerful men who ever lived is not something one does lightly. So it was with some hesitation that I opened the pages of Simon Sebag Montefiore’s acclaimed Stalin: The Court of the Red Tsar (2003). Montefiore begins the biography on a night in November 1932 in which Stalin and all the leading Bolsheviks and their wives were having an intimate holiday party. Up to this point, despite the mass carnage they had wreaked on Russia and the peasant class, the political elite lived a charmed life together, a so-called “golden age”, strolling around the Kremlin relaxedly with their kids, and taking vacations to the same Black Sea resorts. All of this would come to an end on this particular night in which Stalin’s beloved second wife, Nadya, returned home alone after a public row and killed herself. Thirty-one years old to Stalin’s fifty-three and mother to Vasily and Svetlana, she had been his secretary since before the Revolution and, like many of the Bolshevik women, a historically important character in her own right. In a gripping novelistic account, Montefiore shows how this most mysterious and tragic event of Stalin’s personal life began the downward spiral towards the Great Terror of the Thirties. As a student of history, political philosophy, and literature, I have long been interested in the phenomenon of the dictator–the set of conditions that facilitates his rise to power, the ways he remakes a government and state in his image, and the ways he is portrayed and resisted by writers and artists (the topic of my essay The Dictator Novel in the Age of Trump). Stalin, more than any merely regional potentate like Rafael Trujillo or Mobutu Sese Seko, was basically the Dictator to whom all dictators bow down in (dis)respect; the cannibalistic Cronos who ate all his own children; the monster who out-monstered even Hitler. The fact that Hitler is (rightfully) our universal archetype of monstrously inhuman dictator rather than Stalin is mostly because of the not insignificant detail that we were allied with the latter in the world’s biggest war. Regarding Hitler, the title of world’s worst human and author of the most heinous genocide has not stopped him from still being read and worshipped by neo-Nazis in America in 2017 (including the current American president). Regarding Stalin, even his image as an ambiguous but not-all-bad tyrant is being rehabilitated by the current Russian government. Vladimir Putin, himself an illiberal second-rate dictator and master of false equivalence, has stated that “there is no difference between Stalin and Oliver Cromwell”. Whatever that means. Someone named Marx once said that history repeats itself first as tragedy, then as farce. Stalin and Hitler formed a secret alliance that led to WWII; Putin and Trump are now allies. Draw your own conclusions. The importance of reading true history and biography is that it allows us to work out complex series of causes and effects, and to make sense our own world and how it got to be this way. But also because that old cliche about history repeating itself really is true in a certain fundamental way–this is because the ways in which humans wield political power is fairly limited and predictable, and also because most ideologies human have created share many commonalities. If we want to examine 20th century authoritarian ideologies, for example, we can quite easily find a set of overlapping traits between Fascism, Nazism, Falangism, Marxism-Leninism, Stalinism, and Maoism. They all believed that the ends justify the means, that individual lives are meaningless, that violence is necessary or even good, and that the Leader is indistinguishable from the State. Resistance to existing dictatorships requires no knowledge of the leader’s biography; resistance to future potential dictatorships, on the other hand, does. While I have no interest at all in reading about Hitler (Don Delillo’s White Noise was enough), reading Stalin’s biography has been slightly disturbing but also very insightful. It’s not always easy to continue reading such a book, heavy with chapter after chapter of paranoia, manipulation, and the vicious blood baths inflicted by Stalin and all his equally monstrous lieutenants. It is only Montefiore’s telling of this important story that really draws in the reader and makes it impossible to quit. Neither the man nor the ideology find any semblance of redemption here, but it does help to account for the lengths to which humans can go (or the depths to which they will sink) in furtherance to their ideology. Bolshevism, as much a religion as a political system, maintained that a classless utopia was possible if only the old capitalist corruption were destroyed. One of the most useful facts we can understand by reading history is that there is no utopia that will ever be free of human corruption, and that power should never be concentrated into individual hands. Montefiore comments that: “It is hard to find a better synthesis between a man and a movement than the ideal marriage between Stalin and Bolshevism: he was a mirror of its virtues and faults.” Now we must continue to be on guard against the next would-be dictators of our own age, the type of charming psychopath who values power over others as the ultimate goal and would subsume entire continents to achieve it. The German government, a coalition of Angela Merkel’s conservative Christian Democrats and the center-left Social Democrats, has decided to allow prosecution of one of its citizens, a comedian named Jan Böhmermann who read a poem which mocked Tayyip Erdogan, the President of Turkey. This is because there is a law in Germany’s penal code that forbids insulting foreign leaders. The decision was made by Merkel despite protests from her coalition partners. Thomas Oppermann, the leader of the Social Democrats, said: “Prosecution of satire due to lèse-majesté does not fit with modern democracy.” Even Merkel admitted that the law should be changed and that Parliament will do so in the next session. It should be obvious that there are some important issues at stake in this case. I have previously written about Freedom of Speech here (about the Espionage Act and government secrecy) and here (about Charlie Hebdo and terrorism). I am not an absolutist when it comes to Freedom of Speech; I think that it is not permitted when speech comprises credible threat of violence against a person. Insults and mockery, on the other hand, however offensive they may be, are fair game. Giving offense is not a crime, nor is bad taste; they are both protected by freedom of speech. I like to think of freedom of speech as the first among equals within the “First Amendment suite” of universal human rights that are the backbone of any free society: Freedom of Speech, Religion, the Press, Free Assembly, and Free Petition of Grievances. Without these most basic protections, no society can be considered free. When these rights are impinged upon, a society becomes less free. My concern in this case is not for Germany. There is no doubt that Germany is a free, but imperfect, society (there has never existed a perfect society). The fact that the left-wing and right-wing opposition in Germany are in agreement with the Social Democrats that prosecution of Mr. Böhmermann is the wrong decision shows that Germany is not turning into an authoritarian state. Merkel herself clearly said she would try to eliminate the ridiculous law that allows for such prosecution. The problem is not with Germany. The problem is with Turkey. Turkish President Erdogan has ruled his country for the last 14 years–the first 11 as Prime Minister and the last three as President. For the first few years he was widely praised as a reformer and modernizer who could bridge East and West. Turkey was in discussions with the European Union about potential membership from around 2004-2009. This candidacy stalled ostensibly due to a series of major problems with human rights that were far below EU standards: there was reported to be a lack of freedoms of expression, thought, conscience, religion, assembly, and press; there is also a lack of impartial judiciary, children’s and women’s rights, and trade union’s rights. This does not count to lingering problems of the oppressed Kurdish population, the Cyprus question, and the ongoing official denial of the 1915 Armenian genocide. Since the EU integration process was suspended, there has been a clear move in Turkey even further away from these reforms and more towards authoritarianism. I have previously written about the legacy of Kemal Atatürk here. While I am highly skeptical of any consolidation of power into the hands of a single person–a dictator or autocrat–there have been historical cases in which the situation called for such a person in order to make otherwise impossible reforms. Atatürk is one such case of the rare benevolent dictator. Other historical examples can be counted on just one or two hands, and the assumption should always be that these necessary dictators give up power as soon as possible (for example, when Garibaldi conquered the Kingdom of Naples in 1860 and began implementing constitutional reforms, before voluntarily and peacefully giving the territory to the newly united Kingdom of Italy six months later). One of the lessons of history is clearly that all power corrupts (another theme I have discussed here). If we look critically at the career of Tayyip Erdogan, we can easily follow the path he has led towards authoritarianism, with no apparent sign of his giving up any power during his lifetime. He has moved away from his early reforms towards crushing all opposition and making laws according to his own personal diktat. The tragedy of Turkey is that it has the potential to be a great country with a free society. It has no need of a dictator. It is similar to Russia in both these regards. But power corrupts. And when certain men (because it’s always men) hold power for too long, they begin to see conspiracies and threats around every corner, and they tighten their control of state institutions and limit any lingering freedoms already existing in the country. These men are always afraid of armed uprisings or military coups d’état, but what is just as dangerous in their minds is mockery. When a dictator consolidates his power, writers, comedians, artists, poets, and intellectuals of all stripes are immediately placed under surveillance, exiled, imprisoned, or shot. This is because dictators cannot stand the idea of anyone openly making fun of them, even if it’s a joke about their facial hair. Only the dictator sees a real potential threat from a joke by a poor comedian about the dear leader’s whiskers. In this case, Erdogan has followed the dictator’s operating manual to the letter. It has long been troubling that a law exists in Turkey that forbids criticism of any kind against Kemal Atatürk. The existence of such a law is itself an affront to freedom of speech and historical inquiry. I respect the achievements of Atatürk, but no leader, living or dead, is free from criticism from his subjects or posterity. The danger of such a law has been made manifest in new laws clamping down on criticism against Erdogan, and the complete disregard for freedom of speech and the press that now seems to plague Turkey. 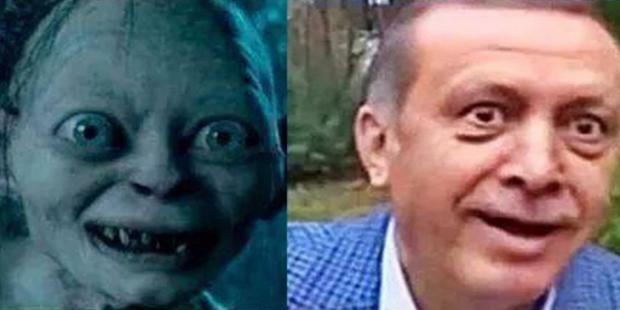 Erdogan has ruthlessly pursued prosecution of anyone expressing any criticism of him, such as a Turkish doctor who posted an (admittedly uncanny) comparison between his President and Lord of the Rings villain Gollum. Erdogan is now taking his game one step further by exploiting a little-known German law to pursue a case against a German comedian who mocked him on German television. This comes at a key time in which European governments are relying on Turkey to stop the influx of refugees through Turkey into Europe so as to appease the growing right-wing xenophobic parties gaining steam around the continent (and the world). Erdogan, always a wily operator, will take advantage of this deal to demand that European governments import his version of press controls in return for cooperation on refugees. America is by no means a perfect society, but at least it has probably the strongest tradition of freedom of speech and of the press in the world (even if the limits are constantly being tested). In how many other countries in the world can you imagine a comedian not only mocking a sitting president to his face for 20 minutes on live television, but even living to tell about it. That is what happened with Stephen Colbert and President Bush in 2006, and happens everyday of the year with other comedians, writers, or just normal citizens on social media. As I have explained, jokes and speech are allowed to be offensive or in bad taste. My freedom of speech allows me to publicly disagree with what someone said, but not to silence them. The only exception is violence or threat of violence. When America talks about exporting freedom, this is what is meant. It takes a combination of strong leadership and a willing populace to gain such freedoms in the first place. It is unfortunate that the former is lacking in Turkey today, though we can hope that the latter still has a vote in the matter.